Situated on the Village Green commanding views of Cardigan Bay. The Lion Hotel has been developed and extended from an Olde Inn into the Hotel it is today offering a unique personal service of friendliness, comfort and true hospitality. In our elegant Pink Restaurant you can enjoy a mouthwatering selection of freshly prepared local produce from our five course Dinner Menu complemented by our extensive Wine List. Traditional Sunday Luncheons are also served each week. A varied Entertainment Programme is scheduled throughout the year, which always includes dancing, with the Restaurant bar open on these evenings. 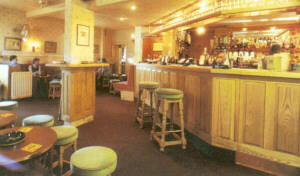 In our recently refurbished Lounge Bar, guests can enjoy a game of pool or a chat with one of the local characters. Also on offer - live entertainment twice weekly. A large selection of bar snacks can be enjoyed at both lunchtime and early evening. The separate Cocktail Bar is the ideal place for residents and their guests to enjoy an aperitif or a quiet, late night tipple. All our bedrooms have en suite facilities and offer remote control colour television, direct dial telephone, radio, alarm clock and a complimentary tea and coffee tray. A lift is installed for the comfort of our guests and specially adapted bedrooms for the disabled are available. For families we offer suites with separate children's bedrooms. The Hotel also has baby listening facilities and offers early suppers for children. Cots and highchairs are available. A newly completed and welcome addition to the Hotel is The Castle View Cottage - originally the stable block the Cottage now houses twelve south facing en suite bedrooms. All have views of the Castle. Those on the first floor have spectacular views of the Castle, mountains and sea. Criccieth 'The Pearl of Wales on the shores of Snowdonia'. 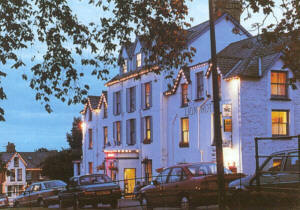 The Lion Hotel is the ideal base from which to explore the lovely Llyn Peninsular and, of course, Snowdonia. Both offer a wealth of places of interest and beauty to visit. Criccieth itself is an unspoilt seaside town facing due south, with two glorious beaches divided by the headland, on which sits the 700 year old castle. The bathing is safe and there is plenty of opportunity for sailing, sea and river fishing, country walks and riding. The local 18 hole golf course will challenge any for the beauty of its surroundings. Concessionary rates available to all Hotel Guests.